In his My Word of October 6, “Environmentalist Wake Up Call,” Uri Driscoll suggested that the Northcoast Environmental Center is “not in the Klamath River talks.” That's just not true. In fact, the NEC remains very much engaged in ongoing discussions and negotiations over the future of the Klamath, in both formal and informal arenas. The NEC has raised objections to some serious problems in the proposed Klamath Basin Restoration Agreement -- the water deal that would give Upper Basin irrigators first rights to Klamath River water, as well as cementing in place unsustainable farming on key wildlife refuges for the next 50 years. We're not alone in raising those concerns, which have been reported in a number of newspapers, including the New York Times, the Los Angeles Times, and the Christian Science Monitor. Last week, as the NEC's new Klamath campaign coordinator, I attended the Klamath Plenary Group meeting in Portland, Oregon. As reported by Uri's brother John Driscoll Oct. 30 in the Times-Standard, the purpose of the meeting was to finalize and release for public review the Klamath Hydroelectric Settlement Agreement, which calls for all four mainstem Klamath dams to be removed beginning in 2020. The NEC remains troubled by the continued linkage between the Hydroelectric Settlement Agreement and the KBRA. Like our fellow KBRA skeptics at the Hoopa Valley Tribe, the NEC voted to release the final Hydro Agreement for public review. Neither the NEC nor the Hoopa have definitively rejected the proposed Klamath deal at this point. We are keeping our options open and will continue to work with our partners in the Klamath Basin to ensure our Board of Directors hear all sides of the debate and make a principled assessment before our ultimate decision whether or not to support the Klamath negotiated settlement agreements. It seems to me there is an unsustainable element within the environmental movement here in Humboldt County. The notion that we should all just step back behind the fencing and signs to minimize our impact in order for nature to achieve an often anonymous and unchallenged concept of balance simply cannot work. We have and always will impact our environment, as do all living things. To live is to consume, whether you are an ameba or an eagle. Walling off areas in a restorative effort seems often counterproductive to what should be a realistic expression of our place in nature. What we are going to have to do is continue to develop ourselves as competent participants. Once we are excluded from participating in our community and its special places, we and the walled-in areas are isolated. Humans end up contained in smaller and smaller areas and the nature of which we are a part is also segregated from us. Lanphere Dunes offers permit-only access and otherwise is closed to the public. The area just south of that -- called North Ma-le'l Dunes -- is also open only for guided walks on Sundays at 2 p.m.. No dogs, no horses need apply. Coming south next is South Ma-le'l Dunes which has a small system of trails including a short direct trail to the beach for equestrians. In between the two BLM Ma-le'l parcels is the Gun Club. South from there is the newly acquired Friends of the Dunes property many may know as the Stamps property. This was purchased in large part with funds from the Coastal Conservancy, a government agency devoted to providing access along the California coast. They were also a major factor in providing the public with many of the fantastic facilities at the Manila Community Center. The Friends of the Dunes are in the process of determining how best to use the existing trails many of which horses have always been allowed on. The Stamps loved having riders show up at their house and had spoken of putting in a hitching rail for visitors. That is one of the proposals that has already been offered to the new owners. Equestrians and those that just like to see horses out enjoying the fresh air with them of course hope the Friends of the Dunes will have the foresight to keep the majority of the horse trails available. We should be concerned however because NO HORSE signs have been put up already. The owner of Wildberries and a major donor to Friends of the Dunes, Phil Ricord has a bright, beautiful daughter who just loves horses and rode with my late wife and I many, many times. When I spoke with Phil he was not aware there were these issues concerning equestrian use. It would be a shame if his own daughter may not even be able to ride on the trail named after her dad's business. This is a trail that has been in use by both horseman and hikers for a long, long time. According to the Friends of the Dunes, there have been no stated conflicts to date. We tend to stay on the trails, are generally pretty darn courteous and can be a real asset in an emergency. 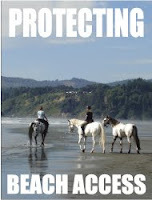 The Friends of the Dunes is seeking public input involving issues for the various user groups. They have said there will be meetings in the near future for the general public as they have already invited their Manila neighbors to one last week. I encourage all of you to make your voices heard at and/or at the upcoming public meetings. I can be reached at . Uri Driscoll is a lifetime horseman and a resident of Arcata. 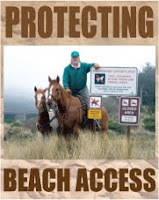 I appreciated Uri Driscoll calling attention to the equestrian access issue of the Stamps property that has been acquired by Friends of the Dunes. I am puzzled and troubled by the “No horse” signs on these trails in the dunes that have been traditionally used by equestrians for many years. It is a shame that equestrians are being increasingly restricted in their access to public lands on both national and now local levels.